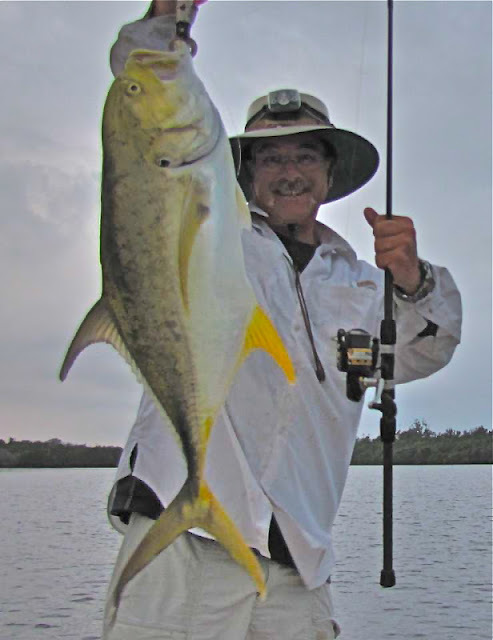 Anglers have been anxiously waiting for the fall snook season to open. Tonight at midnight, you will be able to find plenty of anglers in search of a slot size fish for the table. It's that time of year! The spillways will be one area that will be very active. With all the recent rains and runoff, you can bet the snook will be there feeding and find lots of anglers there as well. The DOA TerrorEyz in rootbeer color has been one of the most popular lures for the spillways.The jetties are always good areas to target snook with live baits, Bait Busters and feather jigs. Check your license and snook permits! You know that law enforecment will be out checking. It's not worth the fine to take the chance. Even though shorelines licenses are free, you are still required to buy a snook permit. Check now and be ready. This morning it was pretty nice on the north jetty, we had some good cloud cover and the sun popped in and out, there was a little breeze blowing and the fish were going off! Earlier this morning, good sized Mutton Snapper were abundant on the outgoing tide, and although they aren't real picky eaters, they were taking mojarra. Several Mangrove Snapper made appearances, a couple of Pompano were landed, a Black Margate, a couple of Black Drum. The sun came out with a vengeance and the Redfish bite turned on at slack tide and the beginning of outgoing. It was hot...in more ways than one! We didn't see any Snook landed, but they are there. "Big Dave" Hartwell and his friend Josh Sullivan fished last night and reported many, many Reds and Snook in the slot and otherwise were hitting last night. The duo plan to be on the north jetty at 12:01 a.m. tomorrow morning, for the opening of Snook season. Please remember, the slot is 28" - 32", one per person per day! Inlet regular Mike Ricciardi of Vero Beach fished the north jetty yesterday and reported a Redfish bite that was off the charts. Mike spent a couple of hours fishing and said there were 60 - 80 Reds landed in the 16" - 30" range, about 75% of them were keepers! Jacks, Bluefish were landed for those who let the tide take their line out more than 100'. Mutton Snapper were hitting before Mike's arrival. Our first photo today features Hanna Knudsen of Sebastian her first cast landed this oversized Red using a greenie. Greenies were abundant around the north jetty that evening. her and her friends landed a 18' Red and a couple of Mangrove Snapper that evening as well. Our next two photos feature 13 year old Logan Escue of northern NJ who landed this C/R Red while fishing the south side using a rattle trap. He said this fish was heavy and the Reds were schooling up! Photo three is of Logan with an 26" keeper Red. Logan was floating a live shrimp on the south catwalk. Our fourth Photo features Rex Hailey of Wabasso with a 24.75" Red and 5 slot Mangrove Snapper he landed yesterday morning. …is just a day and a half away for those of us on the east coast of Florida. Catch and release snook fishing has been very very good all summer long, and all signs point to a nice start of the season. The mullet are making their annual trip south down the beach, pilchards and greenies are stacked up in the intracoastal, and the snook are getting baby making off their minds and turning their attention to EATING! Expect some crowds for a week or two, especially at the popular spots like Jupiter Inlet, Juno Beach Pier, and other Palm Beach area bridges; but after a few weeks the crowds start to thin a little. By nature the snook are going to feed better at night, so give up the sleep if you can for the best results. Try to fish moving water for best luck. We will be discussing all of these things at our upcoming Snook Series Seminars @ Juno Bait. Be sure to swing by and check a few of them out if you get a chance! It's another beautiful morning at the Sebastian Inlet. Winds are blowing out of the South-Southwest at 6 mph and the water is calm. The water is dark with run-off, but the fish are biting! Photo two is of Walton Malcolm who is also known as "Jamaican John" to the locals. Walton landed the Black Drum using dead shrimp. Mangrove Snapper are being found on the flats. A lot of mullet are in the water, all sizes. 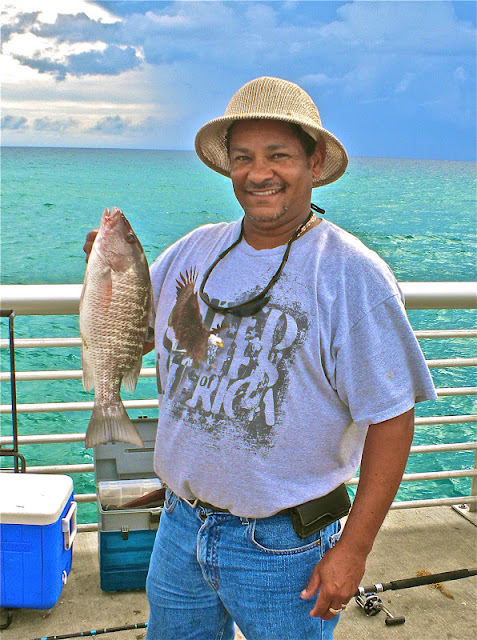 Our photo is of Chris Gladney with four 13" Mangrove Snapper he landed from 1:00 a.m. - 4:00 a.m., using live shrimp. Taylor Creek has been very good with snook and tarpon, the new mirrolure c-eyes has been working very well in the red and brown color along with the doa cals. This weekend should be good with snook season starting on Saturday. The inshore bite has been good with trout and redfish around the spoil islands to the north of the inlet. With the rain there has been snook and smaller tarpon at the spillways also there has been some snook on the incoming tide in the inlet and the bridge. The Hot Spot today was Boynton Beach Inlet. There was SNAPPER, SNAPPER and more SNAPPER -- some good size fish came over the rails today. A nice mix of fish - blue runners, a few blue fish, some nice jacks, a snook or two, a few small muttons and grouper, moonfish, a redfish, even some small yellowtail snapper, but the story today was Mangrove Snapper. This is how it is after every GOOD storm we get here. After sitting through all the rains of Isaac, I am anxious to get back on the water again. I guess it gave me a chance to catch up on things around the home place, but being pent up has never been to my liking! We managed to get out a few days before the rains arrived and has some nice conditions to enjoy the fishing. Fishing will depend on how all the recent rains have affected the area. Until all the flood runoff is gone, you might have to change your fishing tactics to find where the fish are. Trout fishing continued to provide us with some action while fishing drop offs and sand bars on the river. DOA shrimp and live baits helped us catch some nice trout around the river. Most of our fish came from north of Fort Pierce. We are still catching a lot of snapper on the flats as well. Most are short, but we have also caught some nice keepers in the mix. Most fish have come in two to five feet of water along the river. Try fishing docks, bridges and channel edges for snapper and sheephead. Don't forget to try some top water lures early in the day when fishing on the flats. Mackerel, jacks and bonito have been crushing the bait around the Fort Pierce Inlet recently. Nice size macks are in the turning basin. Most small, shiny lures will get you in on some fun action. We are still finding redfish in the shallows of the flats. Most have been sitting in one to three feet of water.A few anglers have hooked up on several nice redfish and landed a few slot fish. DOA shrimp, live or cut bait can help you find a slot size fish this time of year. Tarpon, jacks, snook and bonito had been cruising along the surf and feeding on the bait schools. When you get out along the beach, look for bait schools and you should find the fish nearby. Fishing will get back to normal soon and hopefully we don't have to deal with another storm like Isaac this year. Look for bait schools around the river this time of year and you should find fish. There has been a tremendous amount of bait around. 08-28-12 TUESDAY: CONDITIONS HAVE IMPROVED! What a difference a day makes. Yesterday we had rough weather, lots of wind and rain from TS Isaac which spawned some tornados in Indian River County. We hope all of our anglers came through it unscathed. This morning is a different story all together. The sun is shining, there's a breeze blowing at 10 mph out of the South-Southwest and there is a moderate chop on the water. There are no fishermen on the jetty this morning, but we have some surfers in the water taking advantage of a small swell. We received an update from Desmond of Melbourne who braved the elements yesterday and went out on the south side for about 20 minutes. Desmond reported thick seaweed and the only activity he saw were finger mullet, but nothing was hitting them. Desmond moved to the north side for another 20 minutes and said the seaweed wasn't as bad. Snook were slamming mullet at the end of the jetty, but he couldn't get any to bite. Our first photo today is of Shawn Robinson of West Melbourne. Shawn landed this Mangrove Snapper in the morning and was one of two anglers to land anything in the early morning hours. Our second photo is of Lena Breedwell of Sorento. Lena was the other angler who landed a Mangrove Snapper she was using live shrimp. SURF/PIER- The mullet should start to move down the beach any day now, and a whole list of predators will be following the buffet line down the beach. Snook, tarpon, jacks, bluefish, sharks and more will all be chowing down as the mullet make their yearly push south. The earlier they come the better, as more top level gamefish will be in the mix. If they push down later it will be more bluefish than anything. The bluefish are just too aggressive for much else to compete with! INSHORE- Snook season opens on Saturday. Those that like to put one on the dinner table from time to time are chomping at the bit to give the snook a shot. 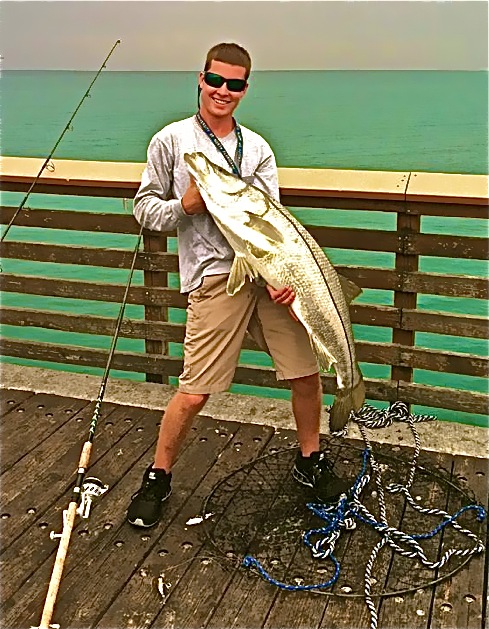 The snook have bit good all summer long at: the Juno Beach pier, beach, Jupiter and Palm Beach Inlet, bridges, and spillways. The snook will be far more likely to play along at night and on moving water. 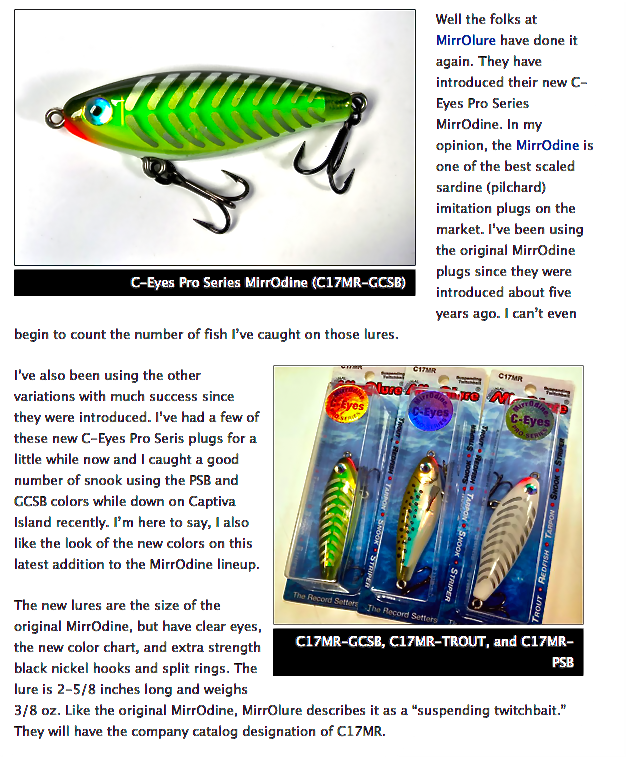 Other inshore fishing is lackluster…at best! We are receiving some of the outer bands of TS Isaac today. Winds are blowing out of the Southeast at 20 mph and gusting to 27. The water is churned up and we don't have anyone out fishing in these conditions this morning. Conditions were less than desirable yesterday as well. We had a lot of rain and the water was rough. We can count on these conditions over the next few days, until Isaac moves further north and west. Hopefully, by the time Snook season opens on Saturday, we will see the winds starting to die down. Tommy Turowski of the Inlet Bait and Tackle Shop reported that Saturday a few Reds, Snook and Bonito were landed off the north jetty and some Mangrove Snapper were landed off the T-Dock on the south side of the inlet. The inshore fishing over the weekend was good trout and redfish along the west bank north of the power lines. Tarpon have been in the mouth of the inlet on the outgoing tide. Snook have been at the spillways, also they have been in the inlet on the incoming tide. This morning we had a nice breeze on the north jetty from 7:30 - 10:00, but unfortunately, the fish were not cooperating. Only two Mangrove Snapper came over the rails during that time and an unidentified angler landed a Flounder in the tide pool. Ladyfish have been very active at night. Hopefully with the water temperature rising, we will see some good activity over the weekend. We received an update from inlet regular Mike Ricciardi of Vero Beach who fished the north jetty yesterday morning. Mike reported that brothers Rick Jablonski and Don Weller of Sebastian were a couple of lucky guys with two keeper Reds at 25" and 26" while freelining live shrimp on the morning outgoing tide. Rick also landed a nice C/R Snook. Mike reported a few other Reds being landed but that was about it until he left the jetty at 10:30. When the tide switched to incoming, the Reds turned off. Rolando Rodriguez and his mom, Elizabeth were the other lucky anglers yesterday morning, they both landed nice Reds. Rolando was using pieces of cut mullet on the outgoing tide to land his oversized C/R Red. Elizabeth's Red was in the slot at 26.5", she was using live pinfish to land hers. They took a quick photo of Rolando's Red and lowered it back into the water by net. Rolando reported the few Reds were the only thing biting, thanks! Nice handling of the C/R Red! Photo one is Don Weller's 25" Red photo two is of Rick Jablonski's 26" Red. Photo three features Elizabeth Rodriguez with her 26.5" Red, and photo four features Rolando Rodriguez with his C/R Red. INSHORE - The best action has been in the Ft. Pierce Inlet with schools of baits being attached by spanish mackerel, jacks and bonita's. All you need is something small and shinny. There has also been a fairly good trout bite around the Queen's Cove and Jack Island areas. The best time has been at first light. The redfish bite has slowed down with only a few fish being reported this week. These fish came from around the docks along South Indian River Drive. Try a gold spoon or a live shrimp. The catch and release snook action has been steady in the Ft. Pierce Inlet at night and on the falling tide. Try a live bait like a mullet, pigfish or a medium size live shrimp. The snapper bite has been good when fishing along the channel edges both to the north and south of the bridges. A small live shrimp or a small white bait has been the way to go. The inshore fishing has been good with the cooler water temperatures, there has been good trout fishing in south Vero, redfish to the north of the north bridge around the spoil islands. The snook fishing has been good in the inlet on the incoming tide, and also at the spillways with all the rain. 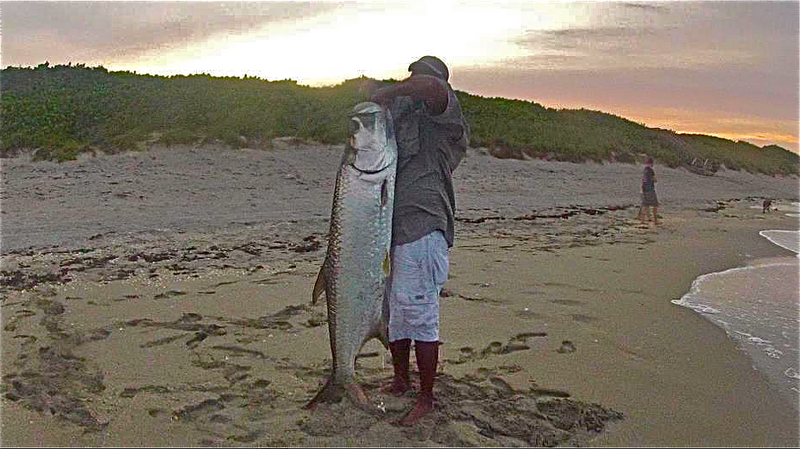 There has been a few tarpon on the beach on the schools of glass minnows. This morning the wind is barely moving out of the West-Northwest, the water is calm and the no see 'ums are out in full force. Take insect repellent if you head to the inlet today! There have been some inquiries regarding Bonito. The Atlantic Bonito is not common in most of Florida and is a deep water fish. It is also known as Northern Bonito, Katonotel and Boston Mackerel. The Blue Bonito also called Little Tunny, False Albacore or Little Tuna is common on all Florida coasts and roams from inshore to deep sea. The latter is what we commonly catch at Sebastian Inlet and most refer to it as Bonito. The Atlantic Bonito does not have spots on its lower half, whereas the Blue Bonito does; both are excellent fighters. There is no fish named Bonita. Our first photo today features Taro Ny who landed this 15 lb. Bonito off the north jetty, using a shiny lure. Taro reported this fish put up a great fight! Both the weather and fish have cooperated this week for us on the Treasure Coast. 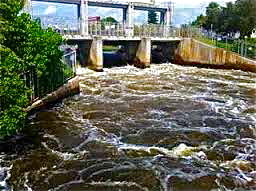 We have enjoyed lots of exciting action all over the Indian River this week. You still need to watch out for those afternoon and evening thunderstorms, but it's been a lot of fun out on the water. I guess the most exciting place to enjoy some great action has been around the Fort Pierce inlet, turning basin and along the beaches. With so much bait moving along the surf and into the river, the fish have been gorging themselves on it. You can witness some crashing action this time of year. Jacks, Spanish mackerel, ladyfish and bonito have invaded the area and we have ended up each trip with a stop to battle some of these fish to end up the day. If you have kids....it's even more exciting for them! Small shiny lures have worked fantastic for us when fishing these areas. You can also find some tarpon around the turning basin. The surf has been outstanding for beach anglers fishing around the bait schools. Tarpon, snook, jacks and various other hungry predators are in close and feeding heavily right now. Trout fishing has been good on the flats. We are still getting some big trout on the grass flats to the north of Fort Pierce. Top water, DOA shrimp and live bait has accounted for most of our fish lately. We have fished most flats up as far as Harbor Branch this past week in three to five feet of water. Lots of mangrove snapper are still around the river. We have caught a good number while trout fishing the flats. Bridges and structure will also be holding many mangroves. Redfish are still in the shallow water. You have to move slowly and quietly to find some, but they are still out there. Try DOA shrimp, top water lures and live baits when searching the flats for a nice size red. It a wonderful time of year to fish! There is so much bait around the river right now and the fish are hungry! Get out early and enjoy some great action this time of year. It's great to live and fish along the Treasure Coast! We have a little breeze blowing this morning out of the South at 8 mph. The water is calm with a light ripple on the surface. The water temperature is in the mid 70's this morning, which is still cool for this time of year. Fishing is still slow, there's definitely fish in the water; they're just not biting much! Bonito continue to dart around, Snook are stacked up around the north jetty, Spadefish and Jacks are out there too We are still seeing a good amount of bait around both jetties. Todays photo is from Bill his wife Lisa and friend Dave and his wife . They were using Shark rigs with Bluefish or Spanish Mackerel, light tackle, 30 lb. test braid on spinning rods with 130 lb. test wire to a 6/0 steel hook. Sometimes it took up to one hour to play out and release a big Bull Shark while using light weight gear. Bill and Dave landed and released (using long handled pliers) three Bulls between 5' and 7' over three days. Bill didn't mention this, but we're sure the anglers where as tired as the Sharks after those battles! It's a real pretty morning at the inlet. Winds are blowing out of the South-Southwest at 7 mph and the water is clean, calm and cold. We received an update from Mike Ricciardi of Vero Beach who fished the north jetty yesterday morning. Mike reported the water was ice cold, but crystal clear. There was a lot of bait in the water, mostly glass minnows (sardines) and the Bonito and Jacks were tearing them up. Several Bonito were landed, Mike got one. A lot of Snook were schooling around the north jetty as were Atlantic Spadefish. The Snook bite turned on about 9:30 a.m. and Mike landed and safely released two, one was 28.5" and one was 34". Bonito were taking lures and live shrimp got the C/R Snook. One Lookdown was caught, but that was about it for the morning. The first photo today is of Mike Ricciardi with one of the C/R Snook. Our second photo is courtesy of SISP Ranger Ed Perry. Ed snapped this photo on his way to work last Thursday, of two anglers fishing the inlet. Inshore fishing around Ft. Pierce has been very good. There has been an algae bloom in the north part of the Indian River which has possibly pushed a bunch of fish south. The redfish bit has been the best I can remember in August. A friend of mine was in the shop a few days ago and said he has caught his limit fishing with three guys, three out of his four trips. In addition to that he's released more than a dozen others. There have also been some nice snook on the flats. The most notable snook caught recently was one caught yesterday by Tony Vercillo. He caught an estimated 30 pound snook on artificial. He was fishing down south in the river using an Exude Dart on a jig head. anglers that were there were impressed and thank you for the respect you showed that fish, nice to see that respect. This week you may have to drive to four not three access points but the fish are still with us so as I said earlier, come on down. but will stay in the deeper water and the Snook they will be deep. Snook the season is closed and Tarpon you can not take so be extra carful when handling them. It's a beautiful morning at the inlet. Winds are blowing out of the West-Southwest at 7 mph and the water is calm with a light ripple on the surface. The water temperature is pretty cool this morning; it's 70 degrees. This morning Bonito are darting around breaking the surface of the water and over the weekend a few were landed. Tommy Turowski of the Inlet Bait and Tackle Shop reported that over the weekend, a few large C/R Snook and oversized Reds came over the rails of the north jetty. On the flats, Mangrove Snapper and a couple of Flounder were landed as well. The inshore fishing has been good with cooler water temperatures and clean water, the trout fishing has been good to the north around the spoil islands. There also has been some redfish along the west bank north of the north bridge. The snook fishing in the inlet has been good with fish being caught on live bait as well as plugs along the rocks, there also has been some tarpon along the beach and in the mouth of the inlet on the outgoing tide. This morning winds are blowing out of the East-Southeast at 7 mph and the water is clean, calm and cold. It's been a very quiet week at the inlet. The bite has been slow on the jetties but some of our boaters have had some luck. This morning there is a lot of activity in the water. Schools of Snook are stacked up alongside the north jetty, schools of Bonito are darting around, breaking the surface of the water, Atlantic Spadefish are visible as are a few Sheepshead. There are a lot of greenies schooling around both sides of the north jetty and there are glass minnows in the mix. A couple of "baby" Goliath Grouper, about 100 lbs each, are lurking under the north jetty as well! There are definitely fish and bait at the inlet, but getting them to bite is a whole different story. One large Bonito was landed this morning in the 10 lb. range and that was it between 8:00 - 10:00 a.m.
Our first photos is of Wayne who was using live shrimp to land the beautiful Permit, he estimated it to weigh between 25 - 30 lbs. This beauty was landed on the outgoing tide. Aldo is featured in our second photo today with a large C/R Snook he landed using live shrimp, that was gently released after the photo. Photo three features Daniel Agate of Statesville, NC with a Silver Sea Trout he landed while fishing west of the catwalk. YOUR BEST BEST FOR BENDING A ROD IS TO WALK ANY OF THE AREA BEACHES. THERE HAVE BEEN JACKS, BONITA, BLUE RUNNER, SPANISH, TARPON, SNOOK AND SHARKS RUNNING ALONG THE BEACH FROM JUPITER TO VERO BEACH. THEY HAVE BEEN CHASING SMALL MINNOWS UP AND DOWN THE BEACH. SMALL ARTIFICALS LIKE A MIRROLURE MIRRODINE AND FLIES SUCH AS A CLOUSER MINNOW HAVE BEEN MOST PRODUCTIVE. Trout, early morning on either a top water or live shrimp. A lot of anglers have had great luck with the redfish. Use live shrimp or a D.O.A. jerk or shad. Lots of jacks and the anglers are pulling up nice size ones. Since the water temps have been cold, flounder fishing in our area has remained steady! Mangrove snapper has been the catch of the week! Jacks, flounder, trout, ladyfish and c/rsnook. The bait fish has been stacked up at the inlet this past week. The tarpon bite has remained steady but other than that, not many reports coming in for surf fishing. August continues to be hot and humid with lots of afternoon thunderstorm activity. It can make things a challenge some days, but the fishing has been good out there and it's well worth while to get out and enjoy the mornings on the Treasure Coast. Anglers found lots of redfish on the flats of the Indian River. Nine year old, Ross, topped off the day and the week for me with a 29.5" sea trout that he caught all by himself on the grass flats. He also released the big fish to be caught another day. Try top water in the early mornings and switch to soft baits like DOA shrimp or CAL jerk baits as the sun warms up the flats. Look for redfish in one to three feet of water and trout in two to five feet as the day wears on. Docks and bridges are holding lots of snapper along with sheephead. The inlet has been alive with mackerel, jacks, blue runners and ladyfish. Lots of exciting fun for everyone. The surf has held tarpon, snook, jacks and even sharks that are in close feeding on the bait schools. It's a great time of year to be fishing! Winds are blowing out of the East-Northeast at 1 mph; the water is calm with a light ripple on the surface. No see 'ums are out in force, be sure to take insect repellent if you head to the inlet. If you forget, they sell it in the Bait and Tackle Shop on the north side, you'll need some! Fishing remains the same, on the slow side. We received an update from Art Caprario that he was out on the northand witnessed a young man battle a large fish for about 30 minutes before the fish ran to the pilings and broke the line. Art believes it may have been a Goliath Grouper. Art is probably right; they have been hanging around the north jetty waiting to steal any catches from the anglers. Fishing is slow enough without any help from the big Grouper! Hook set up. This looks like it maybe fun. It's a real pretty morning at the inlet. The wind is blowing out of the South-Southeast at 2 mph and gusting to 3! The water is glassy and the no see 'ums are out in force, take insect repellent with you if you head to the inlet today! There are only a few people out braving the heat, humidity and no see 'ums this morning. The bite has been typical for August, on the slow side. A nice fish to take home will make an appearance now and then, but they are few and far between. Catch and release Snook have been active, but they are still out of season for a few more weeks. Please handle the Snook with care! Tommy Turowski and the Inlet Bait and Tackle Shop said some Mangrove Snapper were being landed on the flats and a few Jacks came over the rails yesterday, but overall, it was a slow day. We received an update from Skip Stowers of Kissimmee who fished with his son Sean after the rains. Skip reported a beautiful evening with clean, cold water and pods of small Tarpon in the 5 - 15 lb. range everywhere, but they refused to bite. Ladyfish were abundant after dark, but they failed to land anything large. The Stowers' best catch of the night was the 5 lb. Silver Trout in our first photo today, which was released right after the photo.